For years, tech startups have touted their membership in the unicorn club, where the price of admission is a billion-dollar valuation. Now an even more elite group is emerging: startups selected by a $100 billion investment fund from SoftBank (SFTBF). "It's one thing to be a unicorn, it's another thing to be backed by a firm with the global footprint and wherewithal of SoftBank," says Doug Mack, CEO of Fanatics, which raised $1 billion last month led by the fund. The startup is now valued at $4.5 billion. "On a global basis, it's a major credibility building moment for a company like ours," Mack says. SoftBank, a Japanese conglomerate, announced plans one year ago this month for a staggering fund backed by Saudi Arabia to focus on the tech industry. The Vision Fund is still in the process of raising the final $7 billion, but it has already proven to be a 100 billion pound gorilla in Silicon Valley. The fund's stated mission is to invest in "foundational platforms" that will shape the world in the decades to come. In particular, SoftBank's investment team is focusing on areas like artificial intelligence, robotics and enterprise applications. 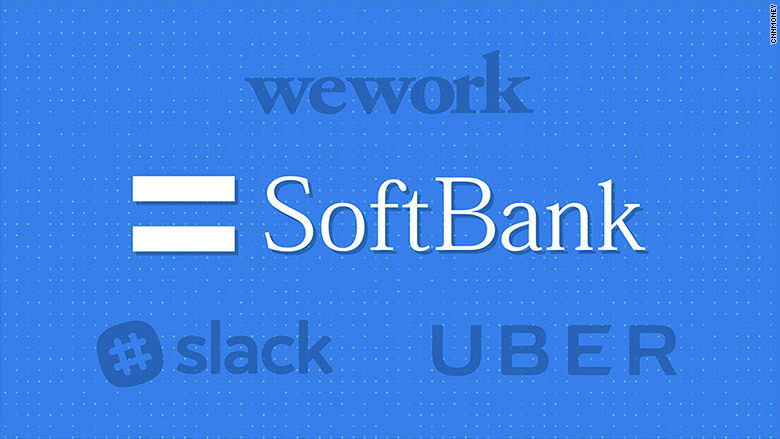 Softbank has invested billions this year in startups like WeWork, Slack and Fanatics, a sports e-commerce company, with more businesses eager to join the club. This week, Uber's board voted to move forward with a deal that could see SoftBank invest as much as $10 billion. The nearly unprecedented scale of these investments offers startups the perks of going public without the hassle, possibly cutting down what is already a low number of tech IPOs. Early investors can cash out, as is expected to happen with Uber. And executives can use the funds to scoop up rivals and attract top talent. Those who've partnered with SoftBank stress that the firm is more willing to take a longer view of startups than public market investors. That's particularly enticing as tech companies like Snap (SNAP) and Blue Apron (APRN) are struggling after going public this year. "What you traditionally get in a public market offering is a large sum of money," says Rob Frohwein, CEO of Kabbage, a small business loan service that raised $250 million from SoftBank in August. The investment was not through the Vision Fund. "What you get from SoftBank is a large sum of money and you have a partner who wants to invest in your vision." SoftBank's backing can elevate the media profiles of startups and help pave the way for expansion abroad, particularly in Asia where SoftBank has its roots. In statements, the CEOs of Slack and WeWork each highlighted international expansion efforts. But SoftBank can also shift how these businesses are run and upend entire markets. Nowhere is this more evident than with Uber. After a year full of internal chaos and PR crises, Uber agreed to make a series of corporate governance changes in part to pave the way for the SoftBank deal. Call it the allure of SoftBank cutting a big check -- or the threat of that check going to a competitor. SoftBank had said it might invest in either Uber or Lyft. SoftBank has previously invested billions in Uber's rivals in Asia and South America. Once the Uber investment is complete, SoftBank will cement its position at the center of the lucrative ride-hailing market, with the potential to broker deals and partnerships. Woody Marshall, a partner at TCV who has invested in Netflix (NFLX) and Airbnb, says SoftBank's money could put it in a position to bring competing startups to the table to "accelerate strategic discussions." SoftBank declined to comment for this story. 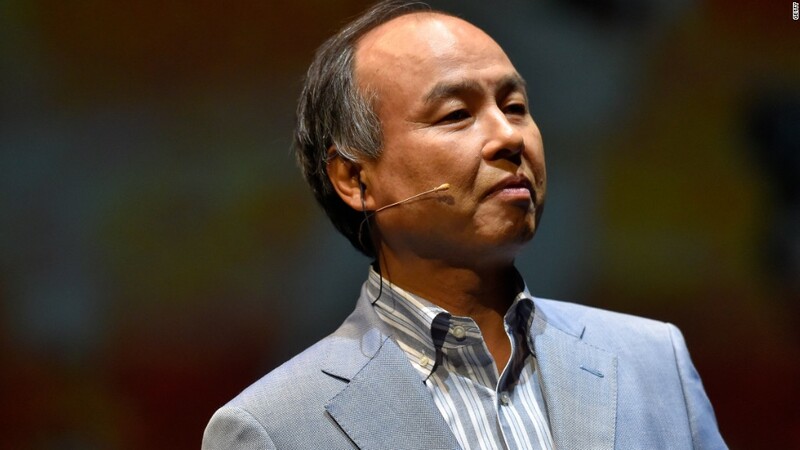 The mastermind behind the Vision Fund is SoftBank CEO Masayoshi Son, a self-described "crazy" billionaire who has talked up a 300-year plan for the company. "We will look to take 20-40% stakes in the companies in which we invest," Son said at a press conference earlier this year about the Vision Fund strategy. "We will become the leading shareholder and a board member, and will talk about running the companies and creating strategies with the founders through an organic relationship." Some may criticize SoftBank for appearing to throw money at startups when there are longstanding concerns about excessive funding and lofty valuations in Silicon Valley. WeWork, for example, was not actively raising funds this year when the SoftBank deal came along, according to a source familiar with the matter. SoftBank ended up investing $4.4 billion in the startup, which provides coworking spaces. "SoftBank coming in with their wherewithal and size probably influenced our thinking on the size of the [funding] round," Mack said. "If we had worked with other partners, it might not have been at this scale." By offering up billions of dollars, SoftBank could end up making it more difficult for traditional venture capital firms to compete for certain startup investments. "I would like to say it doesn't change anything," Marshall says, "but of course it does whenever you've got somebody who has that much money."